K-51 is an agent with the American Secret Service. Z-19 is an agent with the American Secret Service. The series is definitely that of K-51 for his is the codename decorating each adventure and he is the focus of each one. In most, though not all, however, he has the partnership of fellow agent Z-19. For that reason, she gets nearly equal billing. The term "Secret Service" may or may not be a catch-all term for American Intelligence. Regardless, K-51 is an internationally traveled and recognized agent of considerable repute. Sometimes too easily spotted for who he is, K-51 is known to be a dangerous adversary so his enemies are often on their guard against him. Being so apparently well known, however, has its advantages because bad guys seem to relish explaining their plots to him. The missions that K-51 get sent on are by no means easy or light-hearted. In the third recorded adventure he heads to China where he meets a diabolical would-be world ruler named Lin-Sun and her evil machine to kill from a distance. The first victims are residents of a convent and school in a nearby village. Innocent children and nuns are shown "falling to Earth dead". Many another innocent will die at the hands of bad guys who are hunted by K-51 showing how vital his efforts are. K-51 is a blond-haired good looking man with a pencil-thin mustache (at first but a lot bushier as time goes by) and a propensity for sudden action. He loves using his fists and uses them freely. The same holds for his gun hand which dispatches a fair number of adversaries. He is not always victorious at first, though, and he must surely have a cast-iron skull considering the number of blows it receives on his every mission. While we never learn his real name, we can see over the many adventures he has that his lack of a known name is not a hindrance since apparently everybody knows him by his codename. We have no information as to his background other than he is likely well-to-do because he has a personal valet named Wong, seen in a few occassions. In one adventure half-way through his recorded career he is visited by a scientist with some incredible powders he has developed which give K-51 super-strength (and one that lets him shrink to a few inches) but he only used his "vitamins" a couple of times before he apparently ran out and they were never mentioned again. Early in his recorded adventures he comes upon a woman he suspects is an agent for a foreign power. He is partially correct in that she is an agent but it is for his own organization. She is named Claire (no last name given) and she has the codename of Z-19. They save each other and complete the mission, getting friendly along the way. By the end of the next assignment which they happen to share, they become engaged. From then on, though he often works alone, he is joined on many an occasion by his lovely bride-to-be and she shows over again how capable she can be as an agent. On at least one occasion, K-51 is seen getting his marching orders at the F.B.I. headquarters and he is once referred to as a G-Man but I found no evidence he was in fact a Fibbie, especially since near the end of his tales, K-51 is promoted to Chief of the Espionage Bureau of the National Defense Committee. That does not stop him from getting personally involved in cases. 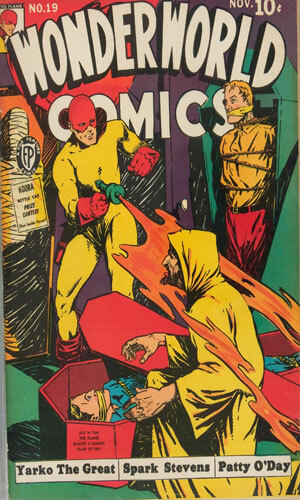 In the tail end of the 30s, the Fox Syndicate of comic book publishing was, for the most part, Will Eisner. He wrote so many stories under so many different pen-names it is stunning. K-51 is one of his creations. 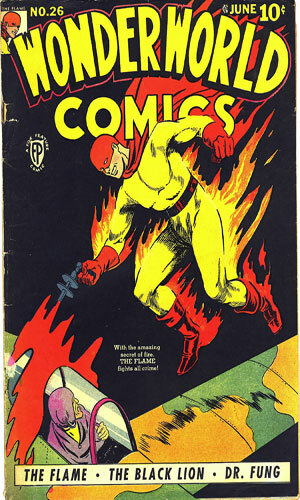 Fox released a new line of comics called Wonder Comics in the spring of 1939. One of the many tales in this anthology was that of an operative named K-5. 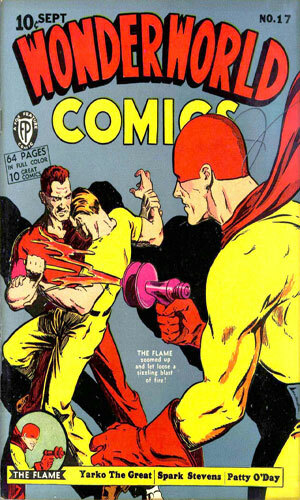 It was a quite short story with a fair amount of action in it, produced by Ned Coe, one of Eisner's aliases. 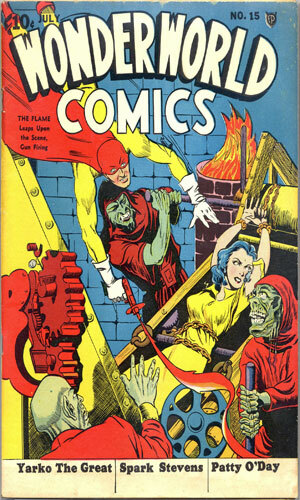 The next issue of the magazine, one month later, had K-5 replaced by K-51 and the "author" was now Willie B. Rensie, another Eisner incarnations. 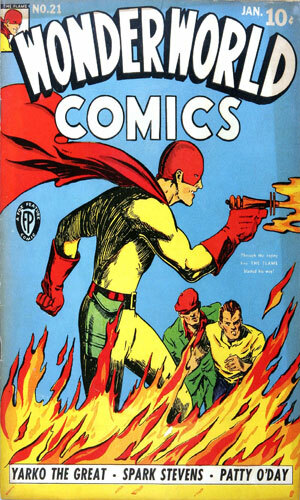 The K-5 story had the tag line of "Spies at War". The first K-51 did not have that tag but subsequent ones for K-51 did. Was K-5 really K-51? Why the switch in codename? Why the switch in writer names? Why the switch in the general feel of the story (my opinion)? Who knows!?! 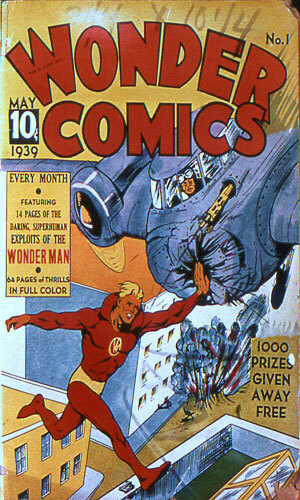 One month after K-51 usurped K-5's position in the magazine, the name of the magazine itself changed from Wonder to Wonderworld though the numbering continued on from 2 to 3. One interesting tidbit about the Wonder/Wonderworld comics. 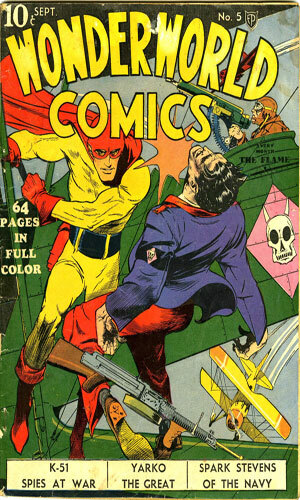 The first issue had the lead character being a creation of Eisner named Wonder Man (hence the name of the comic). 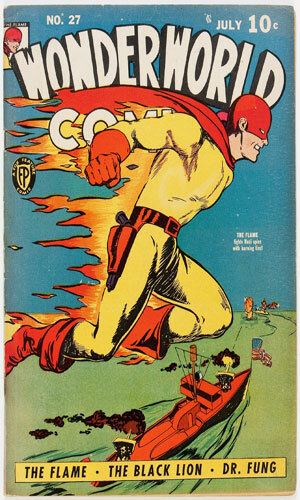 Immediately DC brought suit against Fox for copyright infringement. Wonder Man is seen leaping over tall buildings like Superman had already done. "Too close" claimed DC. "Not so!" denied Eisner. 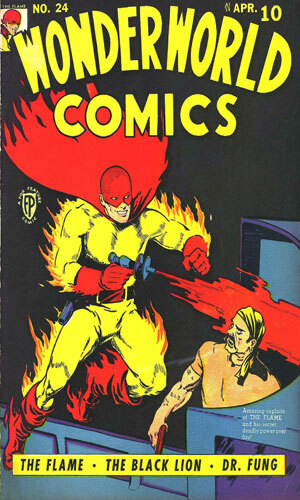 Eisner lost and the character vanished with only the one outing. 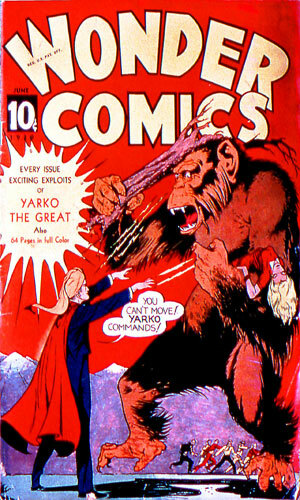 The comic continued with the second issue having the lead character being Yarko the Great but after that, possibly to avoid further complications, the title changed to Wonderworld and though Yarko would still be a part of it, it introduced The Flame. Just as Wonder Man came and went with the first issue, so did K-5. I personally do not consider K-5 being the same as K-51. Just an opinion. 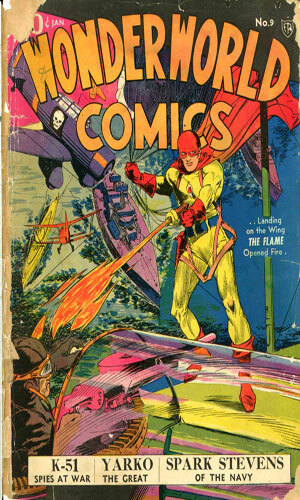 However, since they were in the same comic line and the name is so close and so on, I include the sole K-5 story in the line-up, with that caveat. 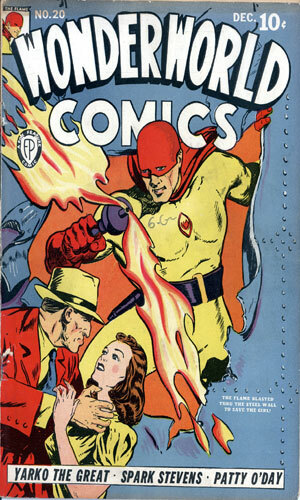 Wonderworld Comics would continue until issue #33 but K-51's missions ended with #27. Note: Titles in quotes are mine. 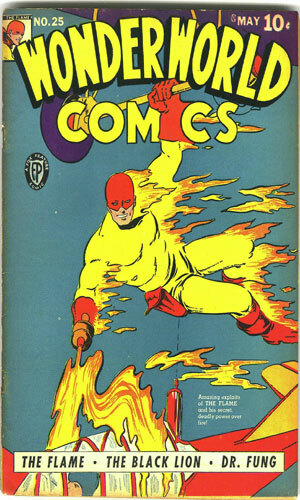 Titles not in quotes come from those given on Comic Books Plus and I liked them. From Wonder Comics #1 - In the foreign country of Mauchako, someone is selling arms to the rebels and Washington sends K-5 there to find who is doing it. 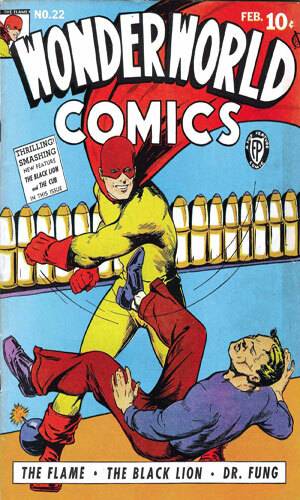 From Wonder Comics #2 - K-51 suspects the new girl friend of his buddy Jack as being a spy and decides to investigate. He learns there is a spy but not who he thought. From Wonderworld Comics #3 - K-51 and Z-19 go undercover to meet the boss of the organization the late Jack Coe worked for. It is Lin-Sun, a exotic Mongolian princess, and she immediately recognizes K-51 and can hardly wait to tell him her plans to hurt America. 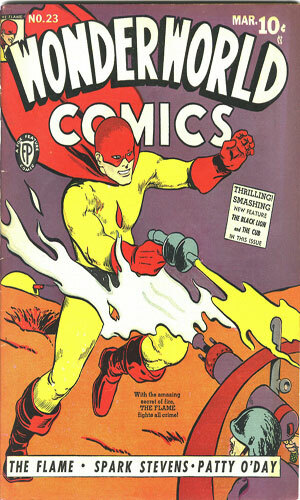 From Wonderworld Comics #4 - A dastardly fellow in Panama is using a radium ray to blow up warships. He has taken out three from Franch, the UK and the US. K-51 and Z-19 want to stop him but they have to stay alive to do so. From Wonderworld Comics #5 - A visiting king and queen are the targets of assassins and it is the job of K-51 to get them off the liner they are on, onto a train and then on the Washington alive. 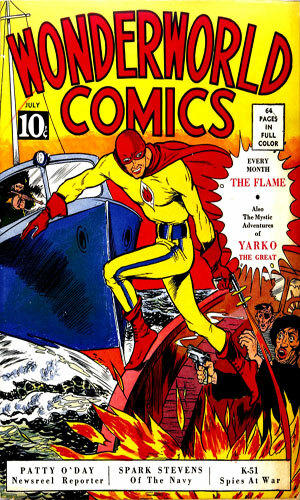 From Wonderworld Comics #6 - Three submarines in a month have sunk from sabotage. K-51 decides he will find out what is happening but that means diving down to the trapped vessel with a traitor nearby. 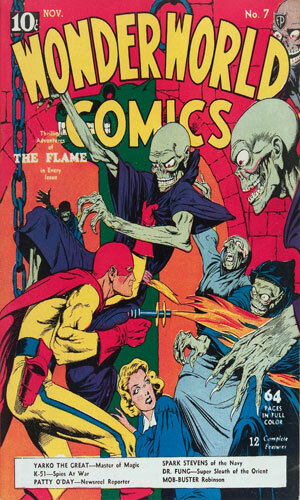 From Wonderworld Comics #7 - K-51 and Z-19 are in Honolulu to uncover a plot they know is being hatched. They discover a German agent with the plan to blow up each of the Hawaiian Islands. 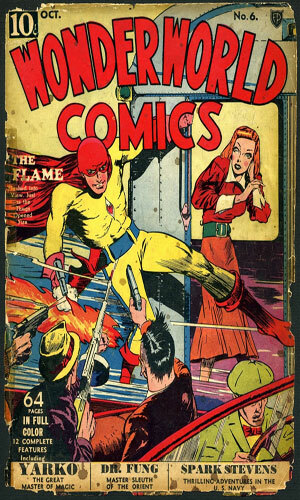 From Wonderworld Comics #8 and reprinted in Blue Beetle #4 (10/1940) - The diabolical Lim-Sun is back with a plan to help a would-be dictator take control of a south-east Asian island nation. K-51 and Z-19 are out to stop her. 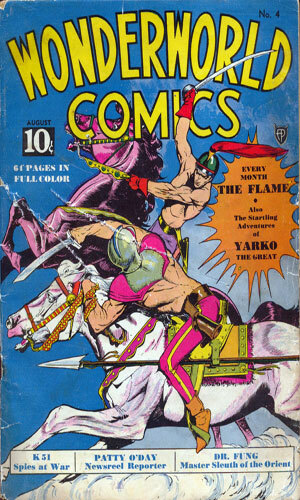 From Wonderworld Comics #9 and reprinted in Blue Beetle #4 (10/1940) - Three European dictators have a plan to work together to conquer all of that continent - until one has another killed in the hopes of ruling it all. K-51 heads there to stop them. From Wonderworld Comics #11 - With war underway in Europe, K-51 is curious how a Q-boat, a disguised cargo ship, could fight U-boats. He asks for a tour and ends up getting a lot more. 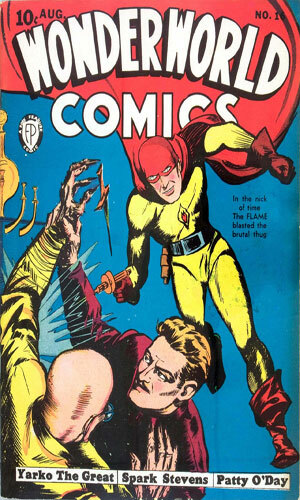 From Wonderworld Comics #12 - A German agent kidnaps a respected English landowner and takes his place to help smuggle other agents to and fro. K-51 gets wind of it. From Wonderworld Comics #13 - "On a lone island in the Great Lakes stands a dreary, desolate House. 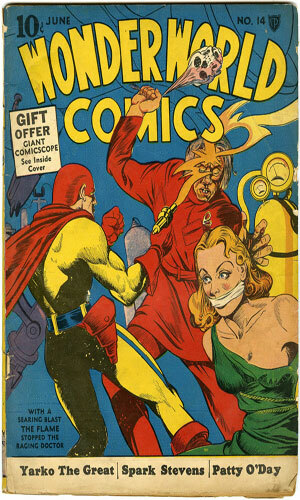 It is here Dr. Hugo Sloan is conducting secret esperiments for the U.S. government, but mysterious things are happening which disturb the doctor's work ..."
From Wonderworld Comics #14 - The foreign spies led by a mastermind named the 'Scar' are destroying cargo ships in New York harbor, hampering aid to England. Z-19 discovers them and is captured. K-51 learns of the next attack and knows his lady love is in danger. From Wonderworld Comics #15 - The 'Scar' has people at several pilot training facilities causing fatalities to scare off all would-be learners to put the country's skies open for his country's attack. K-51 goes undercover as a young trainee. From Wonderworld Comics #16 - A noted scientist shows up on K-51's doorstep with his discovery - three powders that each do incredible things to the human taking them. The 'Scar' has threatened his life unless he turns them over. 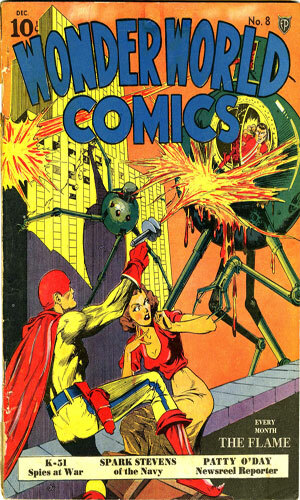 From Wonderworld Comics #17 - A scientist working for the government wants his young daughter to visit and K-51 is assigned to bodyguard her because enemy agents want to control him. From Wonderworld Comics #18 - A foreign spymaster called the 'Head' wants the secret to the powders that K-51 was given a couple of missions ago, which he calls vitamins. He is kidnapped and is threatened with torture. From Wonderworld Comics #19 - A huge influx of tourists has authorities worried that many are really fifth columnists ready to attack from the inside. K-51 and Z-19 are sent to investigate and K-51 is mistaken for his look-alike, the King of the enemy country. From Wonderworld Comics #20 - Chaperoning a visiting Surete officer, K-51 and Z-19 find a jigsaw puzzle message tossed from a window. Trying to put it together, they are accosted by German Bund agents. 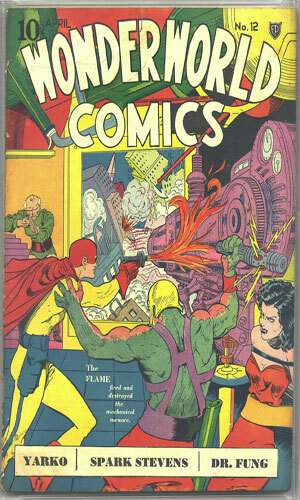 From Wonderworld Comics #21 - Enemy agents under the control of a man named Ontez is blowing up buildings all over New York. K-51 gets a tip that an attack at a train station is about to happen and for stopping it, the agents go after him. From Wonderworld Comics #22 - A major munitions plant in the East has been plagued with a series of minor mishaps. Two workers are responsible and they are fired but they have a new plan to blow up the facility until K-51 shows up. From Wonderworld Comics #23 - Military training camps are being plagued with mishaps and behind it is a woman with a love a perfume. A young waif is rescued by K-51 and it is he, now selling papers on the street, who 'spots' her. 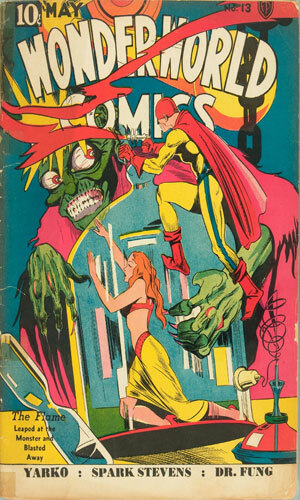 From Wonderworld Comics #24 - The Indian mystic and spymaster known as the "Master" kidnaps Z-19 and hypnotizes her to get some vital ship movement intelligence and pass it on to him. When K-51 gets close, Z-19 is ordered to kill him. 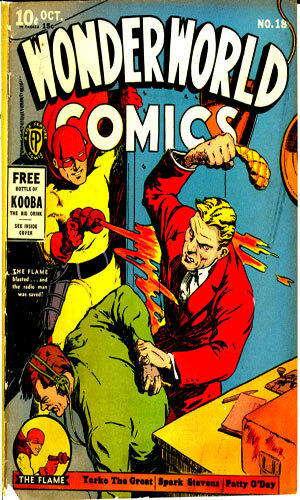 From Wonderworld Comics #25 - The U.S. wants an island for a base but foreign agents convince a wealthy man to buy it first and then when K-51 arrives to tell the man the truth, natives are tricked into attacking. 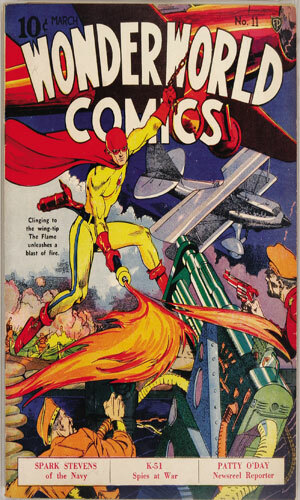 From Wonderworld Comics #26 - A foreign government is planning to bomb New York and Washington. K-51 and Z-19 separately discover the plot. Things get really complicated after that. From Wonderworld Comics #27 - Niki Comso is Public Enemy #1. He has been cornered by the police. K-51 and Z-19 happen by and decide to help out. Their help gets Comso free and Z-19 his prisoner. Well, there really isn't a great deal to recommend about K-51 and his exploits but there is not too much to say badly about him either. The plots are routine ones for that era in that very nasty foreign agents want to do very nasty things to America and its allies and the intrepid K-51 is there to put a stop to them, often in a very nasty way. The things the baddie do are normal blow up factories and drop the odd bomb here or there. The things K-51 does to stop them is standard as well - find 'em, pound 'em, get bumped on the head or shot at, find 'em again and get your revenge. But at least K-51 has Z-19 to help out and she, for once, is not just a tag-along usually needing help. She is independent and self-sufficient. That is a nice change.